Rice is one of the things I miss most on the keto diet. You can't have a burrito bowl without Mexican rice. Sure, there's cauliflower rice for keto eaters, but let's face it: most cauliflower rice tastes like cauliflower with some spices on it. That's why we've created the most terrific keto Mexican cauliflower rice recipe you'll ever try. It tastes more like Mexican rice than cauliflower. Yum! This post contains affiliate links. I may get a portion of the funds from your order at no extra cost to you. Now, you might have seen “Mexican cauliflower rice” recipes before. 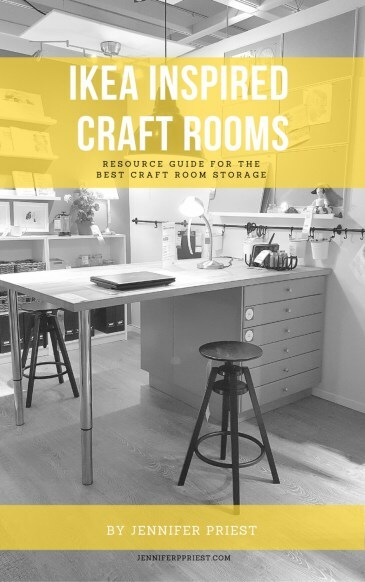 I've seen them on Pinterest too. And they make my blood boil! Putting a bunch of chopped jalapeños and bell peppers in some cauliflower doesn't make cauliflower rice “Mexican”. No Mexican I know puts all that stuff in their rice! Ew. Mexican rice or arroz rojo is made with a tomato base. The flavor comes from spices. And a secret ingredient my family uses every time we make rice, cauliflower or real rice. It's Knorr Selects Chicken granulated bouillon. It's the amazing chicken stock based bouillon that makes any “rice” more flavorful. You'll see how simple and easy this Mexican cauliflower rice recipe is when you get to the end of this post. But first, let's talk about this thing called cauliflower rice. Is “cauliflower rice” actually rice? It's not rice. It's not a grain at all. Chef Benjamin Ford invented cauliflower couscous back in 1998 at Chadwick, a now-closed restaurant in Beverly Hills. This “couscous” was the first time anyone shredded cauliflower and used it as a grain. You can now find “cauliflower rice” in the frozen foods section of most supermarkets. 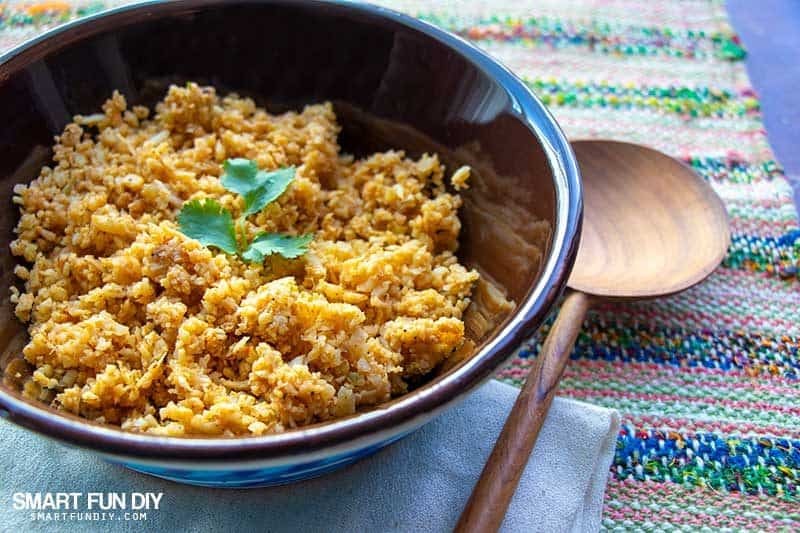 While Ford's intention was for cauliflower couscous to taste like cauliflower, keto and paleo dieters want cauliflower rice to taste more like rice and less like cauliflower. Luckily cauliflower rice is easy to flavor any way you like. Why is cauliflower rice so popular? With the rise of the keto and paleo diets, eaters are looking for more ways to enjoy traditional foods without all the carbs. Cauliflower has about 5 grams of carbs in one cup. In contrast, a cup of white rice has about 45 grams of carbohydrates. When keto eaters are aiming at less than 50 grams of carbs per day, rice is definitely off the menu. Cauliflower rice is a low calorie, low carb alternative to long grain rice. 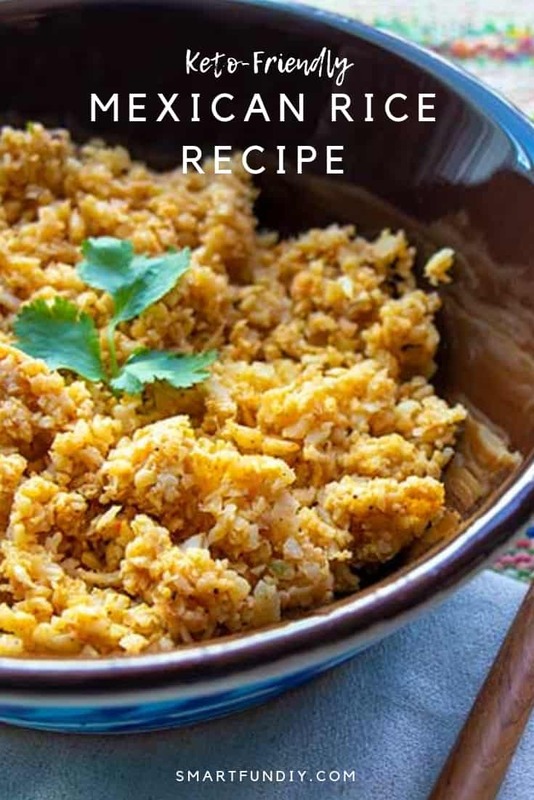 Now, if we could just get it to taste good … keep reading to get our amazing keto Mexican Rice recipe! You can get cauliflower rice in the frozen vegetables section of your local grocery store. While frozen cauliflower rice is convenient, it tends to have a mushy and sometimes soggy texture. You'll need to drain frozen cauliflower rice after cooking because it releases excess water while cooking. Fresh cauliflower rice, made from a whole head of cauliflower, has a texture that more closely resembles grains of rice. Choose a head of fresh cauliflower. Make sure the cauliflower has no black marks or bruising on it. I like to choose organic cauliflower for making fresh cauliflower rice. Organic costs a little more and has a slightly yellower texture than the non-organic variety. I think organic cauliflower tastes better and is a healthier choice because of organic farming standards. If you're gonna go through all this trouble to eat healthier, you might as well REALLY eat healthier, right?! Remove all of the leaves from the head of cauliflower. Cut the head into florets, cutting the stems to yield 2″ to 3″ wide pieces of cauliflower. 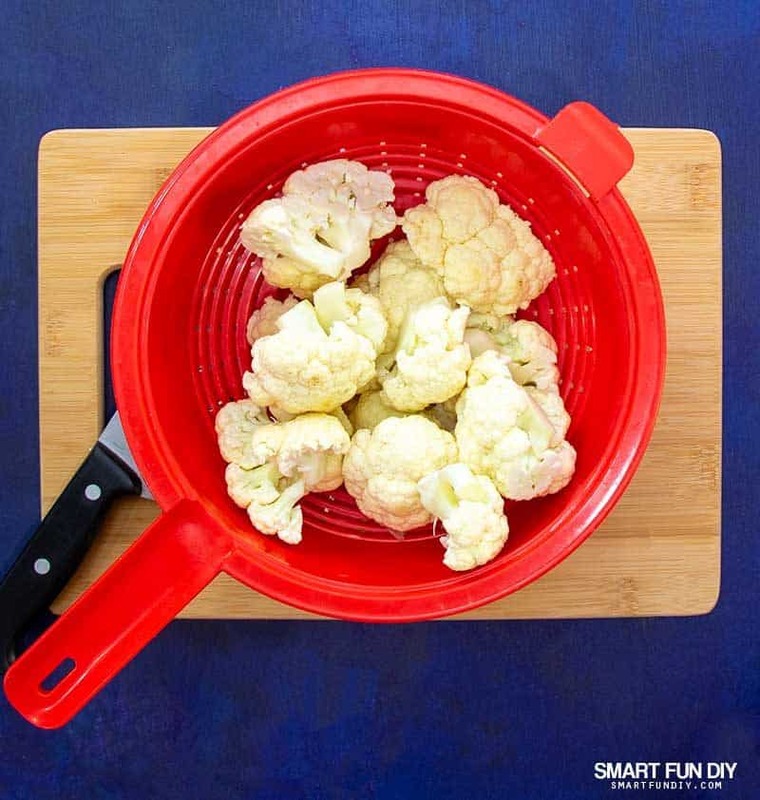 Wash the cauliflower in cool water and allow to drain in a colander. Pat the cauliflower dry with a towel to speed the drying process. The cauliflower needs to be dry before chopping and cooking. Chopping cauliflower to make cauliflower rice yields cauliflower pieces of all shapes and sizes, no matter how much you chop. And shredding cauliflower with a box shredder to make rice is time consuming. I prefer the food processor method because it is faster and yields pieces of cauliflower in a uniform size. What is the best cauliflower food processor? As a wanna-be minimalist, I like smaller tools that can do lots of things. Like Alton Brown says, no uni-taskers in the kitchen! A food processor is a genius invention. But most food processors are big and clunky. When our blender and small onion chopper both died in the same week, we found the ultimate food processor online. It's a blender with a food processor attachment. Imagine if your food processor was just the size of a blender?! Whoever invented this Frankenstein piece of kitchen gadgetry, you're my favorite! They don't make this particular food-processor blender we got anymore but I did find this one that's even better. You'll definitely want to use a food processor like this to make your fresh cauliflower rice if you're eating it more than once a month. 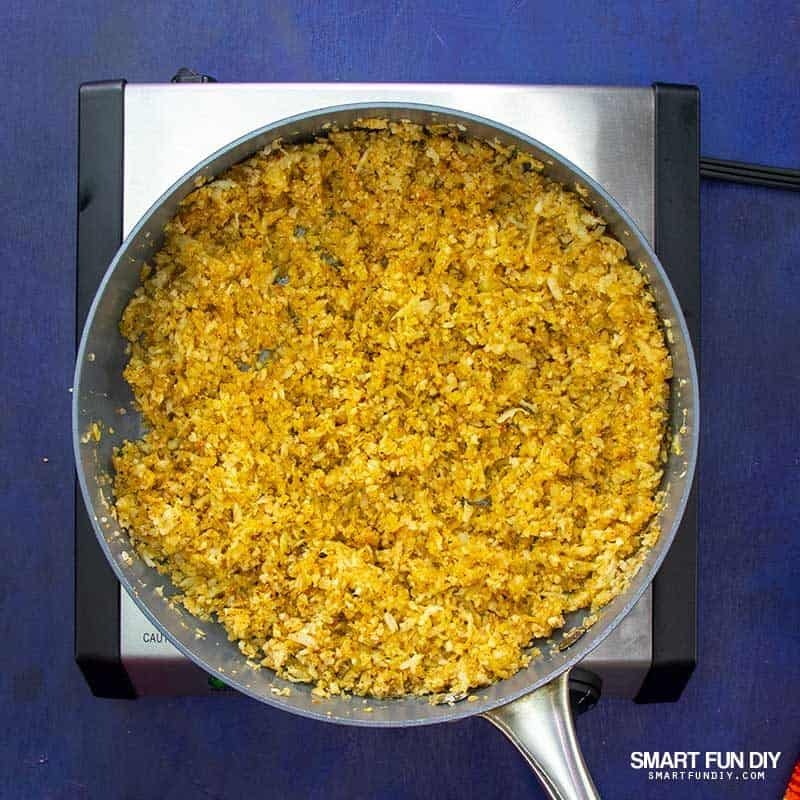 I prefer sauteed cauliflower rice because this process tends to dry out the cauliflower and crisp it's edges, which gives it a texture that's more like rice. 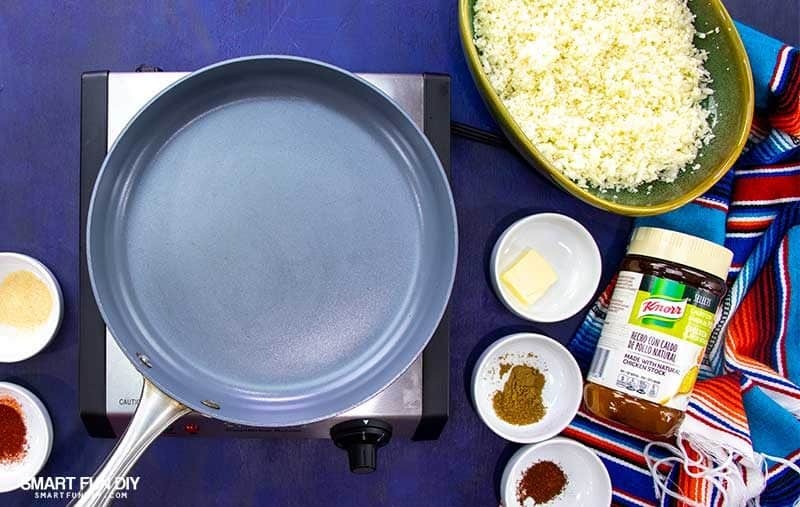 Starting with fresh cauliflower rice will give the best results when sauteing. Steaming and microwaving cauliflower rice will produce “rice” that has a mushy texture. For the best results, pat the cauliflower dry with a towel before sauteing or moving on to the next step in your recipe. If you are starting with frozen cauliflower rice, it's best to microwave it, pat it dry, and then use it for your recipe. Never put frozen cauliflower rice into a frying pan while still frozen as it will end up a soupy mess. A few weeks back, one of my friends called me in distress about my cauliflower fried rice recipe … “it's all watery!”. I asked her to tell me how she made the recipe. No frozen cauliflower rice in the pan. Ever. This Mexican cauliflower rice recipe is a favorite in our household. 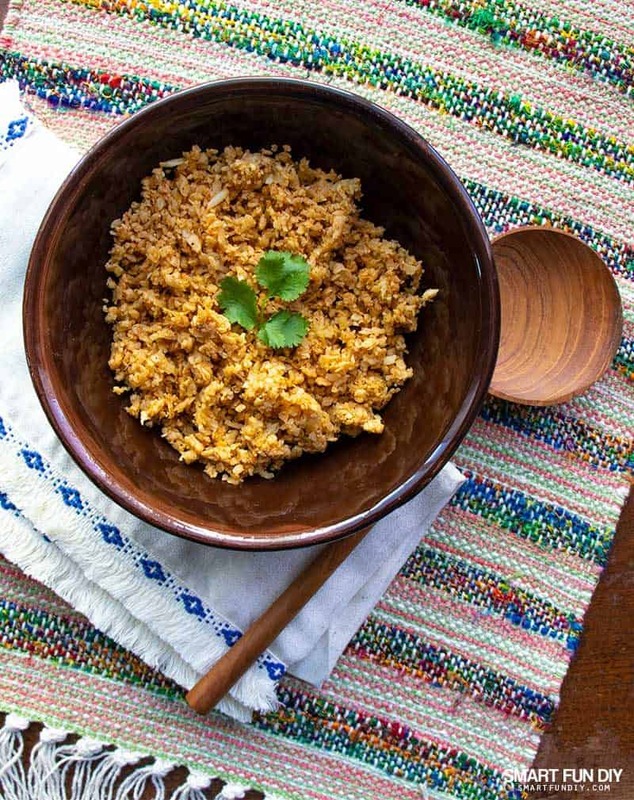 Our recipe was inspired by my traditional Mexican Rice Recipe passed down from my family. 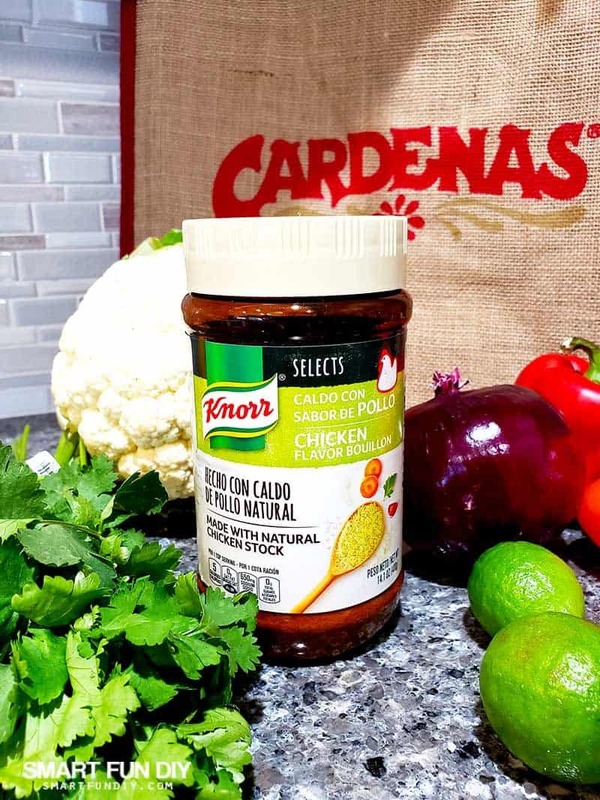 The secret to this cauliflower rice's authentic Mexican rice flavor is the chicken bouillon. I chose Knorr Selects Chicken Granulated Bouillon. New Knorr Selects® Granulated Chicken Flavor Bouillon (14.1oz) is made with natural chicken stock and contains zero artificial flavors, colors, preservatives or added MSG. You can find this all-natural bouillon in your local grocery store in the soup or spice section. Get the printable recipe for your family's next favorite cauliflower rice below. 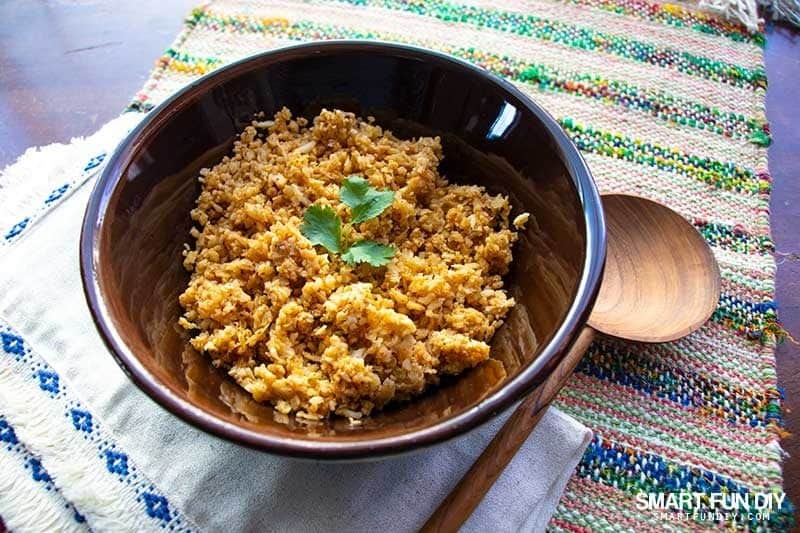 The most delicious and authentic tasting Mexican Cauliflower Rice Recipe. Keto-friendly and made with all natural ingredients, like Knorr Selects Bouillon. This cauliflower rice recipe makes a great base for burrito bowls or a side dish for Mexican food meals.